While the fixtures, floor, mirror and wall design are usually what people are most interested in when thinking about custom bathroom design, many people understand that having something attractive on the floor is just as important. While some people choose to go with bare tile, or whatever flooring they have installed, many others feel that a carefully chosen floor mat adds a little something extra. If you are wondering how to incorporate a floor mat into your existing bathroom scheme, below are four tips to help you. Measure the Floor Space Before Making Your Purchase. Floor mats come in all shapes and sizes, and you surely already have a rough idea of how much space you want your potential floor mat to occupy. Take some measurements of the space where you are planning on placing the mat before you head to any bathroom design showrooms or websites, so that you know that what you end up ordering or bringing home is going to fit. Don’t Clash with the Existing Theme of Your Bathroom. When it comes to custom bathroom design, one of the most important principles to keep in mind is coordination. You have spent money and energy on your main bathroom elements, making sure that the themes jive and the aesthetic is consistent throughout. Bringing in something simple like a floor mat that clashes with what you have going just doesn’t make sense. Different colours and textures say different things. Hues like blue and green are traditionally associated with relaxation and the ocean. They are also more neutral and look good in any bathroom, no matter who it is being designed for. If your bathroom is an ensuite in a girl’s or boy’s room, and they want their bathroom to look like it is meant for a boy or a girl, you may want to go with less neutral colours to make a statement. While you want something that is going to look good, you need to keep in mind that this floor mat is going to be something that is exposed to wear and tear on a daily basis, as well as water and humidity. Something that is able to stand up to all that stress is a must, or you are going to be throwing out a ratty, mouldy floor mat not long after purchasing it. 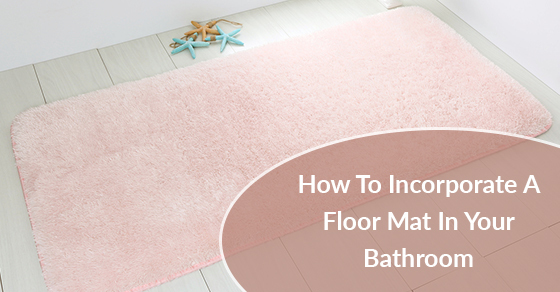 A floor mat is by no means the centrepiece of your bathroom, but it is also not something that you should take lightly. Follow the above tips and make sure you are incorporating a floor mat that is big on style, but doesn’t compromise on functionality and durability.